Windows do much more than provide natural light in a home! They can inspire a mood, generate interest, emphasize privacy, or even serve as a vital component of a unique architectural style. We’ve combed through our Homes of Distinction and created a list of those with some of the most spectacular windows. Scroll down to sneak a peek at our wonderful windows! One of North Canton’s most iconic homes, this modern masterpiece is situated on 3.7 lush acres. Every interior space is spectacular, with floor-to-ceiling walls of windows in the two-story family room, the dining room, and the side staircase. When you’re ready to put on your dancing shoes, visit the downstairs disco and soda bar, The Giggles Room! Enjoy breathtaking, panoramic views through expansive walls of windows in the gorgeous, updated chef’s kitchen and welcoming family room of this stunning, custom-designed home. Surrounded by a parklike yard and the privacy of tall trees, this dream home is light-filled and a joy in all seasons! Ensconce yourself on the penthouse level of the iconic Pinnacle building, where incredible floor-to-ceiling windows frame magnificent views of Lake Erie and downtown Cleveland. Sleek and modern, this opulent residence offers quartz walls, glossy cabinetry, an illuminated staircase, a private terrace, and much more! 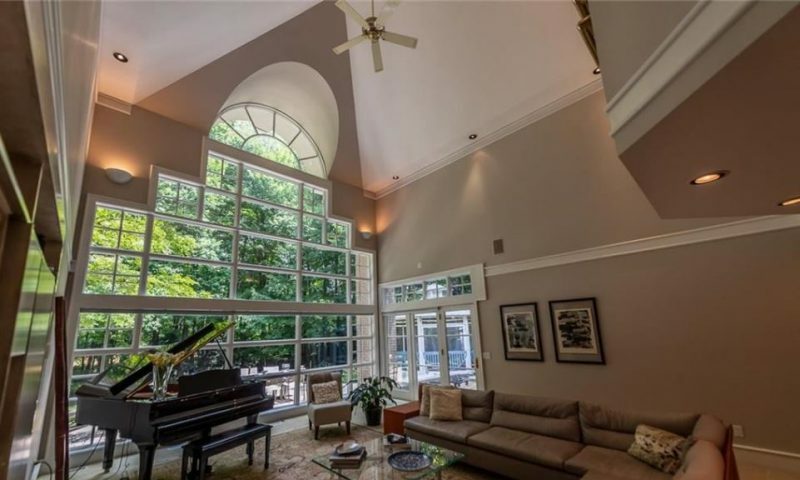 Prepare to be amazed by this stunning, custom-built home, only a short distance from downtown Birmingham! Natural light streams through walls of sliding glass doors in the family room and master suite, overlooking perennial gardens. This impressive Home of Distinction is a private oasis just waiting for you! Enjoy sixteen private acres of tranquility and relaxation that overlook Cazenovia Creek. Each and every space in the house is bathed in natural light, with seasonal views of trees, meadows, water, and beautiful woodlands! Perfect for hosting large parties or intimate gatherings, this fabulous home is an idyllic sanctuary. Situated at the end of a cul-de-sac on eight gorgeous, private acres, this distinctive home is an elegant refuge. Sunlight pours through skylights and walls of arched windows that encompass the spectacular indoor pool. A deck, patios, a gazebo, and a koi pond will enhance your enjoyment of the quiet and secluded grounds. Walls of windows overlook the lake from this spectacular, French Country-inspired estate situated in the heart of the Medina Reserve. Enjoy your morning coffee from the patio of the main-level owner’s suite while taking in the tranquility of the water. A lakeshore gazebo and additional patio areas also offer lake and wooded views. Magnificence, elegance and grandeur characterize this waterfront estate, which offers over 8,100 square feet of luxury in one of the most exclusive communities of Cheat Lake. Sunlight streams in through walls of windows throughout this sophisticated residence. Outdoors, enjoy the salt water pool and direct access to the lake.